Happy New Year to everyone . We have been fairly quiet this week as it is still half term but that doesn&apos;t mean we havnt still been doing lots of fun activities. 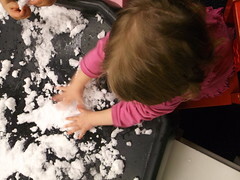 In fact a member of staff from baby room came upstairs looking like a snowman yesterday where she had been exploring shaving foam with the babies and they started clapping with it! Well Im sure you get the picture! Babies have also been painting with stampers on large paper which as well as painting on they have had lots of fun scrunching up in their hands and feeling the texture when the paper was wet. They have been rolling balls backwards and forwards to each other although the only ball they were interested in using for this was the he exercise ball which is nearly as big as them. One child tried to kick it and ended up falling on top of it as he didn&apos;t realise how big it was! Jungle have been learning about hot and cold and doing lots of fun experiments to tell the difference and have been talking about the danger aspect of touching things that are too hot. They have made silly soup, singing the song and to their extreme amusement picking objects out of the bowl and talking about them. They have also enjoyed a lot of messy play, with shaving foam, but also with mud this week due to the amount of rain we have had in the garden the children have been able to play in the mud kitchen inbetween torrential downpours! Castle room is under transformation at the moment, if you go in there you will find an interactive board for the children to use with Velcro backed people and clothes and a map of the world is going up shortly with people that live there. There is also an exploration area for the children to explore their environment with magnifying glasses and binoculars etc. and today when I was in there they were making table top pictures with cars in paint which they absolutely loved. Christmas is almost here!Blast Off!